Back to the recipes! Here's another I made while staying in the mountains last weekend. It's from Paula Deen ~ I've had her cookbook for a few years and never made anything and finally broke it out. I've been to Savannah twice, both times trying to get into her restaurant but they were all booked up. Somehow. They don't take reservations so I'm not quite sure how that happened! Anyhow, there is a gift shop attached which is very crowded with all the other once hopeful rejects who were turned away from her deliciously fattening fare. A consolation prize, a cookbook autographed by Ms. Deen herself, in a stack of hundreds of other pre-autographed cookbooks for all us saps unlucky to have not made it into the restaurant. I know, I know - wah! Break out the violins for me, LOL. 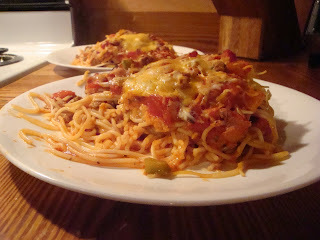 Here it is, Ms. Paula Deen's Baked Spaghetti. It takes a while to make but it is well worth it! To make sauce, in a stockpot, combine the tomatoes, tomato sauce, water, onions, peppers, garlic, parsley, seasoning mixtures, sugar, and bay leaves. Bring to a boil, then reduce the heat and simmer, covered for 1 hour. Crumble the beef in a saucepan. Cook until no pink remains, then drain off the fat. Add the ground beef to the stockpot. Simmer for another 20 minutes. While the sauce simmers, cook the pasta according to package directions. Cover the bottom of a 13x9x2 inch pan with sauce. Add a layer of pasta, then half the cheese; repeat the layers, ending with the sauce. Bake at 350 degrees for 30 minutes. Top with the remaining cheese and return to oven; continue to cook until the cheese is melted and bubbly. Cut into squares before serving. Sounds and looks delish but I personally would substitute italian sausage for the ground beef. How far is Savannah from you? You gotta find a way to get into that restaurant!